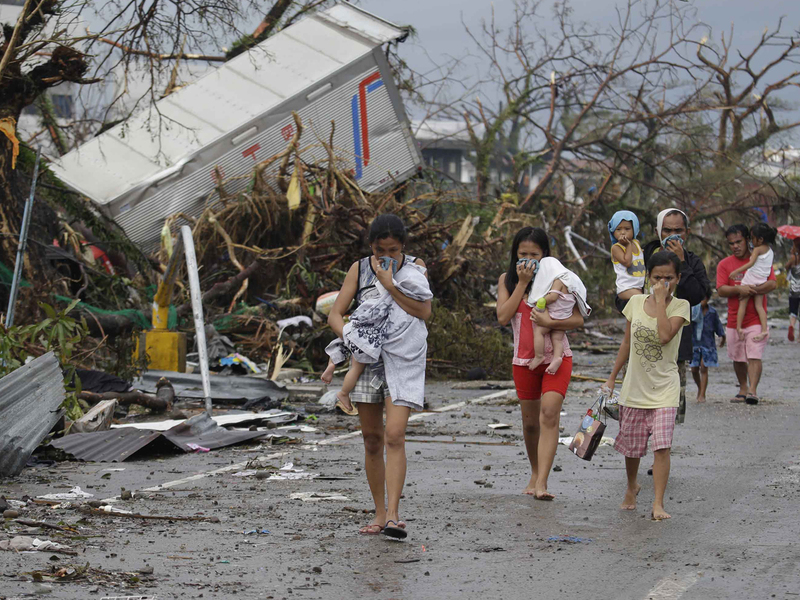 MANILA, Philippines U.S. Secretary of State John Kerry said Monday he told Philippine Foreign Minister Albert del Rosario that the United States is fully committed to helping the Philippines recover from one of the most powerful typhoons on record. Typhoon Haiyan first-hand account: "Everything was gone"
The U.S. government is organizing emergency shipments of critically needed material to provide shelter to the hundreds of thousands of displaced Filipinos and food and hygiene supplies to thousands of families, Kerry said in a statement. He said he assured del Rosario "of our full commitment to providing all necessary assistance." "A U.S. disaster assistance response team was among the first international groups to reach Leyte province, one of the hardest-hit regions," Kerry said. "Experts from the U.S. Agency for International Development are working closely with Philippine agencies to evaluate the damage and identify the best ways to help those who have suffered losses from the storm. Within hours, the U.S. embassy in Manila provided substantial financial assistance for health, water and sanitation." The U.S. military is providing logistical support for the distribution of relief supplies, and the Agency for International Development is helping evaluate the damage from the typhoon. The State Department is also working to send American military veterans to the Philippines to help people recover from the storm, Kerry said. Earlier Monday, a U.S. military plane carrying relief supplies and a contingent of Marines left the Philippine capital en route to the country's typhoon-devastated eastern seaboard. The C-130 left Manila's Vilamor air base loaded with bottled water, generators wrapped in plastic, a forklift and two trucks. It was the first American relief flight to the region, where thousands are feared dead and tens of thousands more homeless as a result of Friday's typhoon. The flight was headed for Tacloban, a city badly hit by the storm and in desperate need of assistance.